I am a textile artist and tutor. I live and work in East Sussex, half-way between the heathland and gorse of the Ashdown Forest and the wind-swept hills of the South Downs with their views to the sea. I am inspired by colour and spaces, pattern and intricate detail. I love the lines of fields and hillsides, the expanse of wild landscapes and seascapes, the greens and blues of the sea, the details of leaves and shells, and the pattern of tree branches against the sky. I am fascinated by the intricate mathematical patterns and spirals found in nature, from seashells and fern shoots to pine cones and seed heads, and I am constantly drawn to ancient visual forms such as Celtic knots, rock paintings and viking runes. I like to use my sewing machine to create my work, but I also enjoy making felt by hand. I am thrifty with my resources and often use recycled fabrics, papers and salvaged beads in my work. 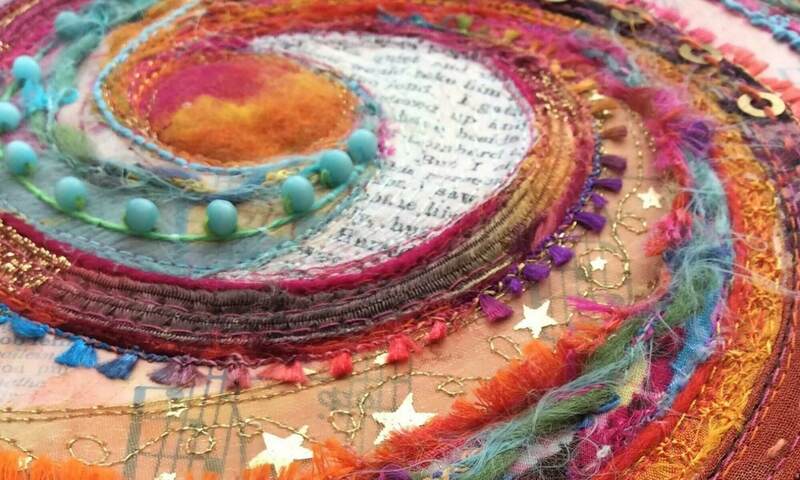 In my teaching, I help people develop confidence and clarity in their textile art. I have spent ten years teaching people (including myself) to move forward with their work in a way that is personal to them, to trust their intuition, and discover their own unique voice. To stay up to date with what I’m doing, please follow me on social media – links are below – or my blog (which I promise to update more regularly than of late!) You can also contact me directly here.